If the cleaning challenges are bringing you down, don’t lose hope. Top London Domestic Cleaners is the company that can best assist you with all cleaning-related housework chores. We have been in the industry for quite some time and we know what people are looking for. A clean home, a refreshed environment and peace of mind that no task can keep you from getting some rest is only part of what we can offer you. We provide the best domestic cleaning in Northwood and all other London areas. Having well-trained expert cleaners at our side surely helps deliver wonderful domestic cleaning in Northwood and beyond. We have invested in hiring and training an elite group of domestic cleaners that can deal with any job. Whether it is ironing, cleaning specific items and rooms of your home or simply doing general chores, our company is here to aid you. Top London Domestic Cleaning is the right firm if you are fed up with coming back from work only to find the place in a mess. With a single call on 020 3322 8143, you can hire the right people for the job. We will deliver the perfect cleaning service on a regular basis and prove to you why people say we are the best. The major goal of our company is to grant you more time to do the things you like. We can do this by cleaning your home to perfection so that you don’t have to. It is super easy to acquire our services by contacting 020 3322 8143. You will be greeted by our friendly staff. Don’t be afraid to ask anything you want to know about our services. We will gladly work with you to deliver the service that best fits your needs and requirements. The suburb of Northwood is located in the northwest part of the capital, entirely within the London Borough of Hillingdon. The area is quite affluent and is very close by to the border of Hertfordshire. The area has a very distinct feel with its leafy and quiet streets, which make it similar to a countryside area. Yet, its location is such that allows effortless transport to other parts of London and its entertainment and work opportunities. Visitors in the area will notice numerous official cars driving through. This is only normal, as Northwood is home to the UK’s Military HQ and NATO Command. Apart from that, the area is well-known for its golf courses. Most famous of them include: Moor Park, Sandy Lodge, Pinner Hill and others. The area offers serene locations for walks. Oxhey Woods and Corpse Wood are a perfect leafy backdrop. To the west is a beautiful succession of lakes ideal for outdoor activities. 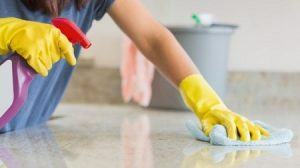 Top London Domestic Cleaners provide excellent domestic cleaning in Northwood. Book a reliable cleaner either online or by simply calling 020 3322 8143.